New York City real estate professional William Balasavage has a natural warmth that immediately conveys that he has each client's very best interests at heart. He connects easily with people, and his attentive, knowledgeable approach quickly earns their trust. With a seemingly innate skill for real estate, Will is available and responsive with eagle-eyed attention to detail and a knack for spotting potential problems before they arise. 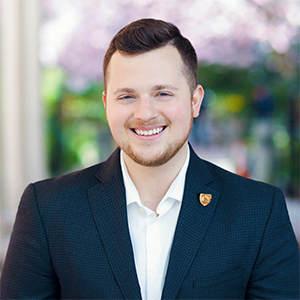 He's forward-thinking and market savvy, meaning he effortlessly wields technology, social media and cutting-edge marketing in service of his clients' goals. As a proud member of The Ingram Team, Will is instrumental in delivering impeccable real estate service with the highest level of integrity. He works with buyers, sellers and renters throughout the city and has a special fondness for helping first-timers achieve their real estate dreams. Originally from Pennsylvania, William holds a BBA in management and marketing from Wilkes University. He's lived in Bushwick and North Slope and currently calls Downtown Brooklyn home. When not serving the needs of his clients, or his two cats, he has a passion for vintage cars and motorcycles, historic homes and all things pop culture.